Spend Mother’s Day At The STONES Hotel Legian Bali! HomeArticleSpecial Occasion Spend Mother’s Day At The STONES Hotel Legian Bali! FOR THE LOVE OF MAMA! Spoil your beloved Mom and give her the best Mother’s Day yet only at The Stones Hotel Legian, Bali. 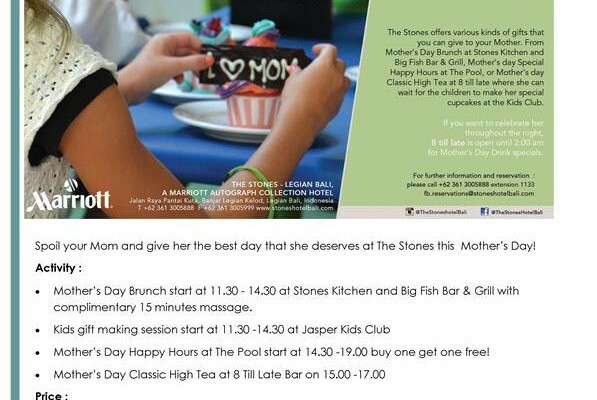 – Mother’s Day Brunch starts at 11.30 – 14.30 at Stones Kitchen and Big Fish Bar & Grill with complementary 15 minutes massage. – Kids gift making session starts at 11.30 – 14.30 at Jasper Kids Club. – Mother Day’s Happy Hour at The Pool starts at 14.30 – 19.00 buy one get one free! – Mother’s Day Classic High Tea at 8 till late bar on 15.00 – 17.-00. Mark your calendar: Sunday, 10 MAY 2015! Sounds like an amazing plan to spend Mother’s Day with your lovely Mama, right? What are you waiting for? Book your spot now at fb.sales@stoneshotelbali.com. Don’t miss the brilliant opportunity!!! The post Spend Mother’s Day At The STONES Hotel Legian Bali! appeared first on Qraved Journal.